That creation care is part of the mission of the Church is widely accepted. But is creation also relevant to the other marks of mission? 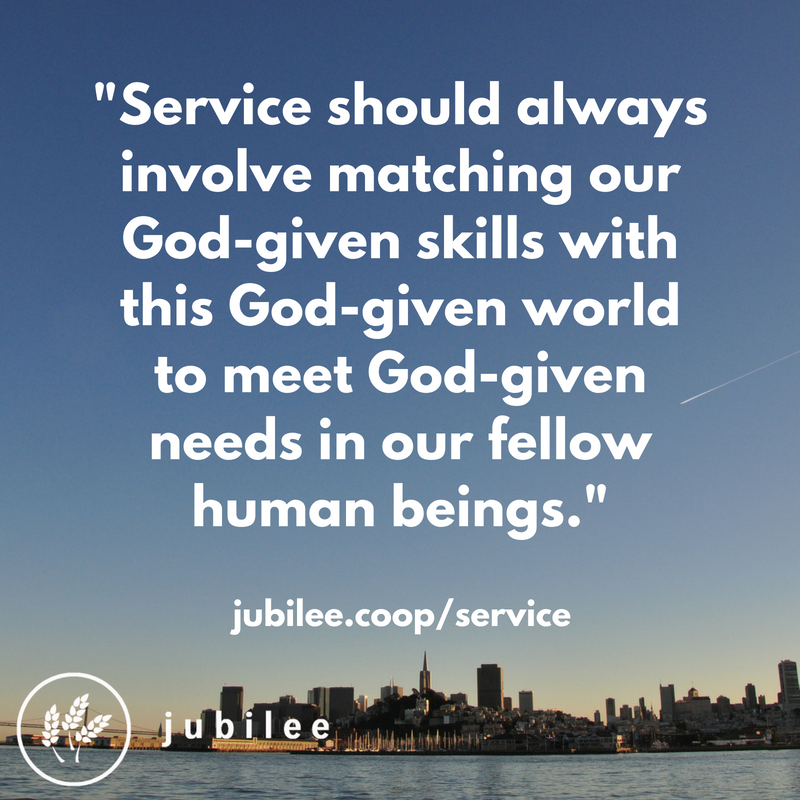 In the third of a four part series, jubilee’s Matt Williams and Jonny Hanson look at service. What defines Christianity? Frequently, whether we’re part of the Church, or on the outside looking in, it can seem like it is the service, of the Sunday-morning variety. And if we’re not careful, endless series of meetings can come to define our faith. Congregating together is of course essential for Christian fellowship, including for proclamation and discipleship. But the Son of God who calls us to a life of radical love personified and practised another type of service, of the world-changing variety. It is this type of service that we discuss here, looking especially at how it relates to God’s creation and to why and how we serve. The third mark of mission is defined as ‘to respond to human need through loving service’. Human needs are complex and varied but can be broadly categorised as tangible needs, such as oxygen, water, food and shelter, and intangible needs, such as love, beauty and purpose. 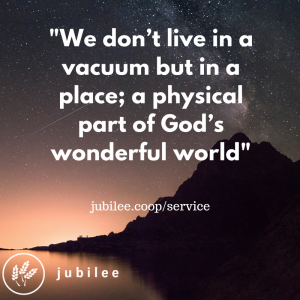 As we discussed earlier in this series, we don’t live in a vacuum but in a place, a physical part of God’s wonderful world. Therefore, every human activity is, by default, an environmental activity, and most human needs have an environmental dimension to them too. 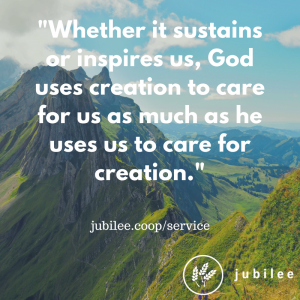 Whether it sustains or inspires us, God uses creation to care for us as much as he uses us to care for creation. Our service can take many forms, be it synthesising new medicines from rainforest plants; restoring wetlands to reduce urban flooding; educating young and old alike about the diversity and wonder of life; or building low-carbon housing that doesn’t cost the earth to live in. But service should always involve matching our God-given skills with this God-given world to meet God-given needs in our fellow human beings. Before thinking more about what this kind of service might look like, we need to step back and consider our motivation. We have already mentioned that the Son of God calls us to serve; that call alone should set us on our way. But a deeper understanding will give us direction and John 17:18 is a good place to start. Here Jesus prays to the Father in the presence of his disciples: ‘Just as you sent me into the world, I also send them into the world’. This sending is at the heart of the cosmic mission of God, bringing new life to the whole of creation through the forgiveness of sins. We cannot replicate the cross, in the sense that it’s a finished work, but when we receive this gift we necessarily enter into this mission with Jesus Christ. Jesus was sent to serve and he also demonstrates how to serve, rooted in God’s love (John 3:16). 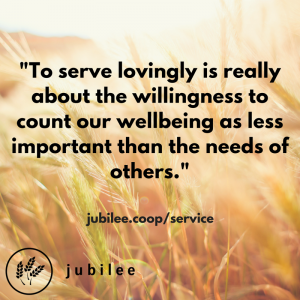 To serve lovingly is not primarily about being nice or sharing others’ feelings (though it can involve both); it is really about the willingness to count our wellbeing as less important than the needs of others. Such cross-like sacrifice goes beyond platitude to (literally) getting our hands dirty, as Jesus illustrated when washing the disciples’ feet. This exemplifies humility; we cannot claim to be humble whilst remaining aloof from the physical responsibilities that come with a planet of 7 billion neighbours and millions of other species. Doing this equitably poses a huge moral and logistical challenge but if we shirk it, our service will remain horribly deficient (more on which in our next article!). However we do it, meeting the needs of others through loving service is a key tenet of Christianity, as Jesus Christ, the Servant King, demonstrated. Realising the links between many of these needs and the rest of God’s creation helps us to ground our holistic mission firmly in this wondrous and inter-connected world. May loving, humble and equitable service, of the world-changing variety, therefore define our faith on Sunday morning, on Monday morning and on every day of our lives.